just in time for Easter. This cloth is a variation of grandmother’s favorite. I used Sugar and cream "rose pink". The pattern can be found here. How can you have an Easter with out peeps? …Check this little guy out. Isn’t he cute? I’ve been admiring this cute pattern and just had to try it out myself. 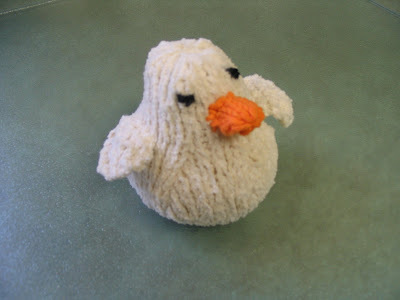 I used my cotton chenille and a tiny bit of orange cotton to finish off this little duckling’s beak. 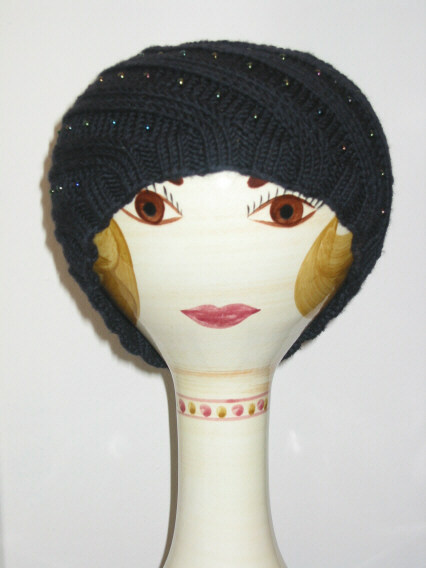 This cute pattern can be found here. For quite some time now I’ve been wanting to try The "Infamous" Darrell Waltrip Cloth. Wow…I really like this cloth! 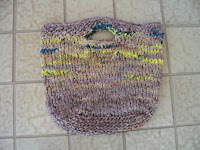 Super easy and I just love the pattern that is created with the variegated yarn. Now I know why everyone has raved about this one! I have the urge to go and knit a cloth with every variegated yarn in my stash (and I've even been thinking about going out and buy more variegated colors....) Just what I need…another cloth to be addicted to. :) Watch out ballband, you now have some competition! 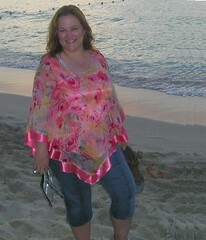 Now I have to get focused and concentrate on getting ready for Easter. Hope everyone has a wonderful Easter! What a cute ducky! The slip stitchcloth looks great! 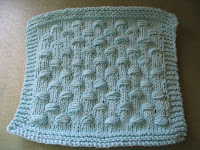 I like both color and stitch pattern. Happy Easter to you and your family! Oh my goodness, that little peep is so cute! Thanks for the pattern link. Love that bunny dishcloth as well. You are right about changing the lamb's diaper. Pee-eww! But not as bad as today when it fell off while she was in her little box and it got all over her. And the box. Icky! Oh dude. I love the ducky. I have been like you, dying to knit that duck but I have yet to. However, I think it has moved very quickly to the top of my list! 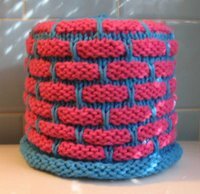 I really need to make some new dishcloths so thanks for the patterns! Yours look great...have a wonderful Easter! 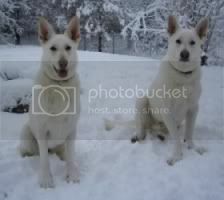 Those are so cute!!! Happy Easter!!! It's all so cute!!! 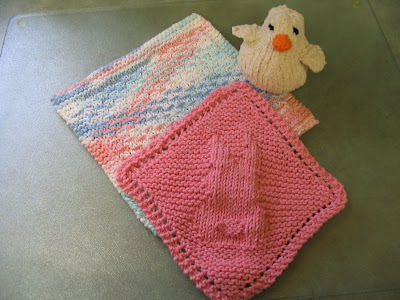 I love that bunny , the peep is cute enough to eat, and that DW washcloth is really cool too! 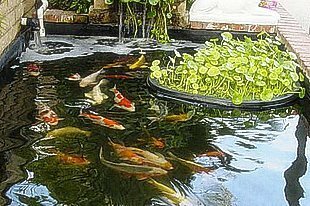 Thank for listing the links. 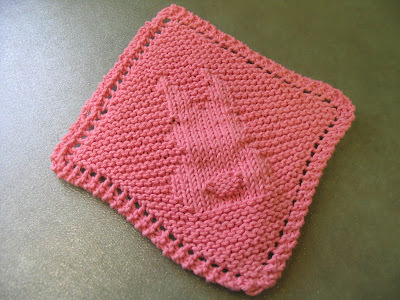 Too funny - I just made the bunny pattern washcloth last night! Now with 2 days left before Easter I'm trying to figure out how many I can get done. I love the way yours turned out in the light pink! 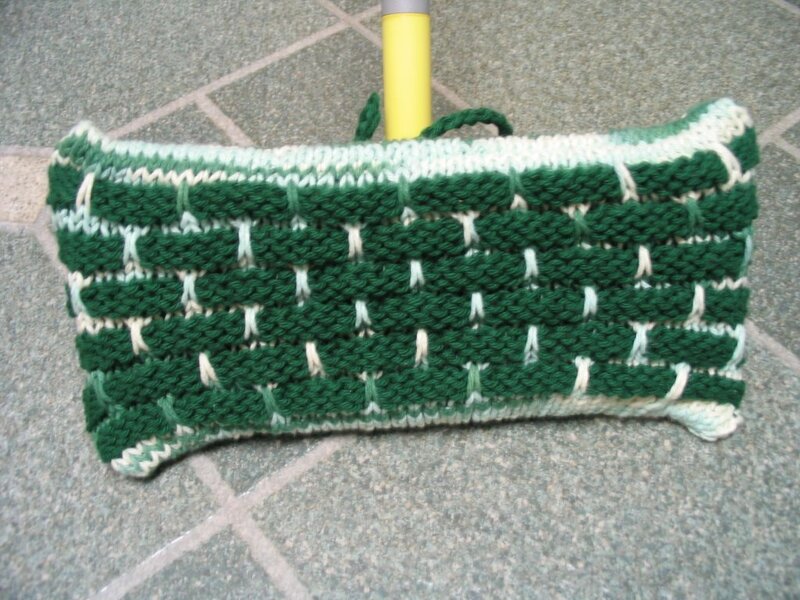 those dishcloths are so springy! and well, the peep is adorable! have a great Easter weekend! I love them all, but the peep is just TOO CUTE!! 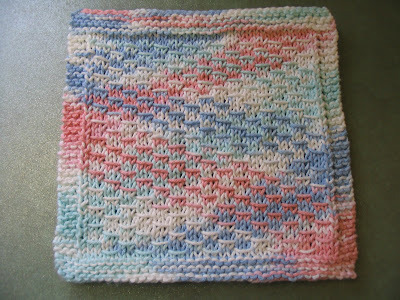 I love that dishcloth pattern, I have made several of those. And the little peep is adorable. OMG! I love your knitted peep!! SQUEEEEEE!!! All hail the mighty peep!